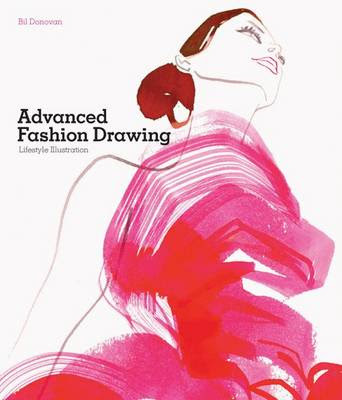 This book represents the opposite kind of path that I myself took into fashion illustration, so it was interesting to see practical and logical approaches to illustrating clothes. As my own visual language comes from more of a graphics and image-making background, rather than a textiles and fashion one, I've never really gone down the route of having to illustrate on a more practical and purposeful level. There's many lessons about composition, line quality and technique that are genuinely informative and useful. Some of the illustrations chosen have a slightly dated feel to them, and aren't as inspiring as some of the others. That said, the images used in the book are there to serve a teaching purpose, the book isn't there to make you create your own visual style, you do that yourself through life experience and personal taste, something Bil is keen to point out in the chapter 'Finding Your Voice'. This book is essentially the teaching block that is required to get there, and there's some great work from the likes of stina persson and antonio lopez, including unseen practice sketches to help understand this. Advanced Fashion Drawing does mainly stick to learning how to interpret the figure and clothing through all different kinds of media, but the rules can also be applied out of a fashion context, and for anyone who hasn't actually studied on a fashion or textile based course, this does give some great lessons and perspective. Chapters such as 'Composing the figure within an environment' are especially useful, as it's something a lot of fashion illustrators find daunting and tend to avoid, including myself, so no matter how confident you are as an illustrator, there will be something here to learn from. For the price of it, the book is incredibly thorough and a lot of bang for your buck.